When Chon Wolson Sang However, by the late 1980's, Wolson was becoming unsatisfied with her career. The vocal techniques she had learned in Tokyo might have been good enough for a comfortable career in Japan, she decided that they were not sufficient for the world stage. She decided to take a year off and reconstruct her voice from the ground up. The only teacher in Japan capable of providing this training was a Taiwanese man who had had a successful Euhon Wolson sang the leading role in Georges Bizet's "Carmen" in the South Korean capital of Seoul last October, she became one of the hottest topics in the Korean media. Not only did her critically acclaimed performance relaunch her international singing career, but she became the first major artist to sing in both the North and South Korean capitals, an accomplishment of great symbolic importance to the Koreans. Back in 1985, she sang at a concert in Pyongyang for the late-North Korean President Kim Ilsung, who praised her talent and beauty. Things did not come easily for Wolson. Born in Tokyo in 1957, her parents had been brought to Japan in the pre-war period along with countless other Koreans to work in the mines and factories. After the war, the Korean Peninsula was divided into two opposing states, and the Koreans in Japan, along with their decendants, lost their Japanese citizenship and entered a political and legal limbo. In the following years, some acquired South Korean passports, a few became naturalized Japanese, but the majority, like Wolson, wound up with North Korean citizenship. Because Tokyo and Pyongyang do not have diplomatic relations, North Korean residents in Japan face special obstacals. The high school that Wolson graduated from was run by the North Korean residents association, and as such was not fully accredited by the Japanese Ministry of Education, limiting her prospects for higher education. Of course, her parents financial problems almost dashed all her hopes for admission to a musical university. While she was in high school, bankruptcy forced her parents to move away from Tokyo. In order to remain close to her music teachers, Wolson moved into a tiny three-tatami room and took a night-job playing the piano. Wolson's family eventually moved back to Tokyo and in the meantime she had gotten herself accepted to the prestegeous Toho Gakuen University music department. After graduating she started a successful career as an opera singer in Japan, joining the Nikikai Opera Company. 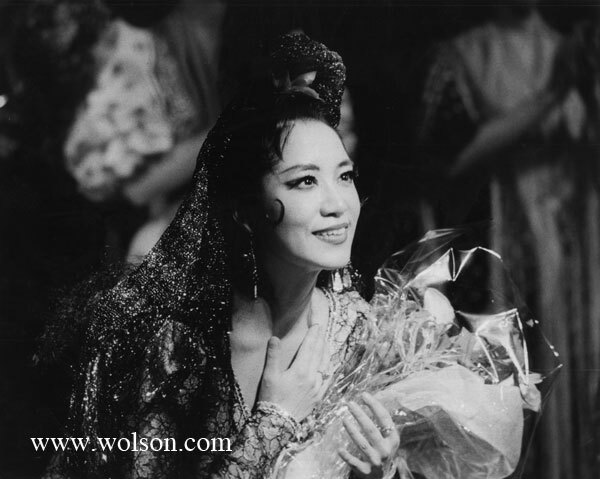 In addition to her performance in Pyongyang, Wolson spent most of the 1980's performing in operas, concerts, and dinner shows throughout Japan as well as in China and the Soviet Union. She was a particularly big star among the North Korean residents and was called upon often to add artistic substance to their events commemorating special occasions, like the birthday of current president Kim Jongil. She made T.V. and radio appearences, was the subject of numerous newspaper and magazine articles, and even had a very interesting full-page color spread of her performing the Dance of the Seven Veils from Richard Strauss' Salome in Focus magazine. ropean career, and he had a reputation for driving his students so hard that they often wound up in the hospital. Week after week, month after month, Wolson made the five-hour round trip to the maestro's home in Zushi for lessons, going twice a week, three times a week, even more often when she had the money. Meanwhile, she maintained a rigorous practice schedule, taught students, and even helped out in her parents restaurant in Nakano. The task of overhauling her singing technique was a much bigger task than she over dreamed. Before she could begin learning the new technique, she had to unlearn the old one, which had become ingrained. What she thought would take one year - two at the most - wound up taking seven! During these years she stopped taking concert offers, stopped dating, stopped doing anything that was not connected with her one goal: to re-emerge as a world class singer. While during most of this period her self-confidence remained steadfast, towards the end even she started to have doubts. She re-examined her entire life and re-assessed her hopes and ambitions. It was at this time that she finally decided to change her citizenship to South Korea. For years she had been growing disallusioned with the political situation in North Korea, but like so many North Korean residents in Japan had resisted doing anything because of the negative repercussions it can have for their relatives in North Korea. The switch also allowed her to accept a long-standing offer from Seoul's Korean Opera Company to star in a production. Her great success in Carmen marked her comeback to the stage and also paved the way for a receital in Tokyo this May. The receital will take place in the brand-new Nakano Zero Grand Hall and will feature Wolson singing and dancing highlights from the opera "Carmen" as well as other Italian and Korean favorites. She will be backed up by some of Japan's best classical musicians. 성악가에 있어서, 성악을 연주하는 자신의 몸은 악기 그 자체입니다. 그 몸이 재일 한국인2세임에, 슬픔과 기쁨을 만들어왔다. 부모님 모두 한국의 경상남도 출신. 동경에서 태어 나서, 고등학교를 졸업 할때 까지 조선학교에서 민족교육을 받았습니다. "일본에서 사는 한은, 일본에서 배우는 음악의 전부를 흡수 하고 싶다." 고 생각해서 일본의 음대를 지망하였으나, 수험 직전에 "고졸의 자격이 없다." 고 문전 박대를 당하였습니다. 부친의 사업의 실패가 거듭 되면서,아르바이트를 해서 학비를 만들어, 토호대학에 입학. 83년에 데뷰한 후로 "남북의 무대를 서면서, 조국이 하나임을 확인하고 싶다." 는 생각이 계속 되었습니다. 조선민주주의 인민공화국(북조선)의 평양에서 개최된 음악제에 초대받은 것은 1985년. 작년 가을에는 한국 서울의 오폐라하우스 "카르맨" 의 주역을 하는 등, 재일코리안으로서 처음으로 " 남북공연" 을 해 내었습니다. 분단된 남북한의 무대에 서게 된것은 "재일이니" 였을지도 모릅니다. "조선반도만이 아니라, 일본에도 조선민족의 혼은있다." 성악을 통해서, 재일코리안의 존재감을 어필된 것이 기뻤습니다. 이번에는"조국은 하나" 라는 생각을, 재일동포에도 전하고 싶습니다. 줄곧 조선적이였으나, 보다 자유로운 활동을 하기 위해 한국적으로 바꾼 것으로, 발아 들이는 식이 변하는 주위의 현실이 슬픔니다. 일본인에도,재일동포들이 지금에도 가족이산으로 힘들어 하며. 전후가 아직도 끝나지 않았음을 알리고 싶습니다. "남북공연"이후, 처음으로 본격적인 리사이탈이 되는 5월12일(동경 나카노제로홀)에는, 일본의 식민지하의 저항의 노래도 조금 섞어서 "정열의 여자" 카르맨을 춤춘다. "일본인의 포함하여 한명이라도 재일동포가 제 노래를 들어 준다면. 전후50년의 제 나름대로의 선을 긋습니다." "오폐라는 종합예술이므로 좋아 합니다.주 특기인 무용도 봐주시 길바랍니다"
지난해 10월 서울정도 600 주년을 기념하여 (에술의 전당)의 오페라하우스에서 공연된 (칼멘)에서 칼멘역을 맡았던 전윌선씨 를두고 한국의 많은 매스컴들은 정치적으로 전향한 소프라노 가수로서 그녀를 소개했다. 그러나 재일한국인 또는 재일조선인 뿐만아니라 내로라하는 귀재들로 차고 넘치는 일본의 음악계에서도 그 타고난 목소리와 뛰어난 연기력으로 주위를 매료시키고 있는 전월선씨의 음악세계와 참모습옴 직접 만나 확인해봤다. ■국민학교 시절부터 민족학교를(한국말로수업읍 진행하는 조총련계 학교) 다니면서	피아노와 조선무용 등을 배웠고 재일코리안이 주최한<大音樂舞踊敍事詩)의 전국공연무대에서 아역으로 참가하기도 했습니다. 이러한 요소들이 종합에술이라고 볼수 있는 오페라를 할수 있도록 해준 방탕이된것같아요. 제가 가지고 있는 재능을 최대한으로 살릴 수 있는 것이 바로 오페라라고생각했지요. 또한 재일교포 일본사회에서 인정을 받기 위해서는 일본인들보다 두배 세배의 재능과 노력이필요합니다. 비숫한 능력으로는 경쟁상대조차 되지 않습니다. -여러나라 여러작품을 소화해야 할 필요성이 있을텐데, 때로는 동양인로서 한계를 느끼지는 않습니까? ■오히려 저 스스로를 한 작품의 인물로 만들어가는 것에는 소질이 있는 것갈습니다. 점점 . 분위기를 만들다 보면 결과적으로는 완전히 그 인물의 인격을 갖게 되는 것이지요. ■물론 힘들었던적이 많이 있습니다 .부모님이 사업에 실패하여 16살때부터 혼자 떨어져서 고학하면서 화장실에서 옷을 갈아 입으면서 피아노 연주를 하는 아르바이트도 했고, 민족학교출신의 학생을 받아주는음 악대학이없어 전전긍긍하기도 했지요 .그 런데 무엇보다도 힘들었던 것은 턱에 이상이 생겨서 소리를 내기가 힘들었던 때입니다. 조선의 국적을 갖고 있다는 이유로 이텔리를 갈수없었던 안타까운 일도 있었죠 . -국적을 북한에서 한국으로 바꾼데에는이유가 있었을텐데요. ■한국 언론에서는 저를 전향가수로서 많이 취급했습니다만. 저에게는 특별한 정치적인 동기는 없습니다.다만 북한의국적을 갖고 있으면 활동에 제약이 많으므로 국제적인활동을 하기위해 바꾸었습니다.